The Supreme Court is working its way to the end of this year’s term with several decisions on major issues still pending. But if the past is a predictor of the future, the high court’s past rulings do not seem to have helped much when it comes to the public’s ability to discern the court’s ideology. The public’s perceptions of the court’s ideology is mixed, as it has been in other recent surveys. A plurality (40%) now say the court is middle of the road, while 24% say it is liberal and about the same share (22%) says it is conservative. But conservative Republicans and liberal Democrats have very different impressions of the ideology of the Roberts Court. 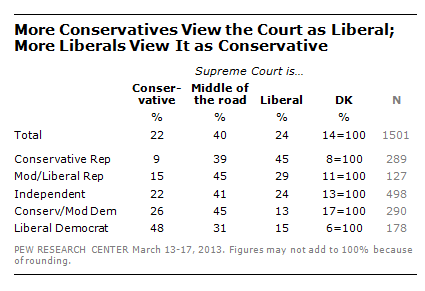 About as many conservative Republicans say the Supreme Court is liberal (45%) as middle of the road (39%). Very few conservative Republicans, just 9%, say the court is conservative.